Pues, en este momento, supongo que es más o menos obvio, ¿no? Mañana Zach y yo darémos una presentación sobre El laberinto del fauno para nuestra clase de literatura española. Entonces, para que la haga la pelota a nuestra maestra, horeneamos alfajores, galletas tradicionalmente árabes que originaron en España, pareciéndose a gli canoli de Italia. Hoy día, hay variedades a través de latinoamérica; las retratadas arriba se parecen a las de Argentina. Sin embargo, todas son absolutamente deliciosas. Because what better way to get brownie points in Spanish 341 than by baking alfajores? 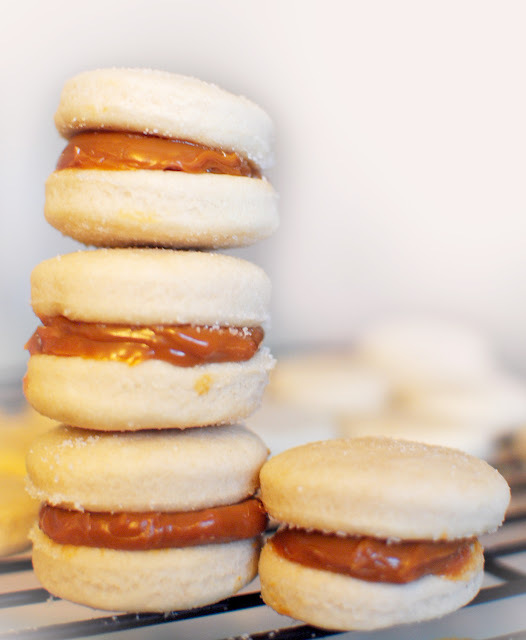 Alfajores are an Arabic confection that originated in southern Spain as early as the 12th century, back when the Moors inhabited the area. The original treat resembled a cylinder filled with creamy, sweet caramel, and over the years has been adapted into countless variations, though the original recipe remains pretty much the same: flour, honey, almonds, and spices. 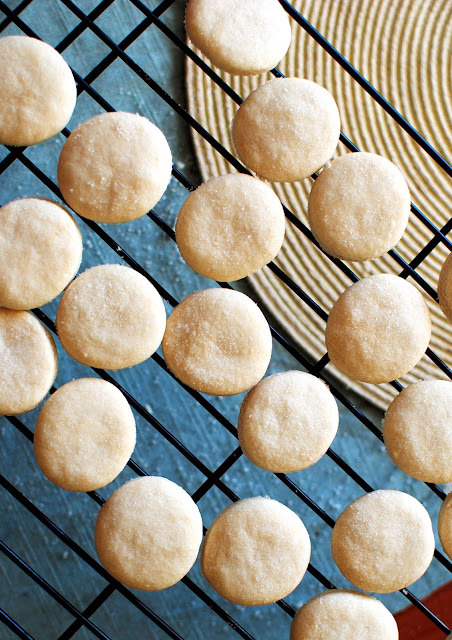 Without all of the innovative new ingredients brought by the Arabs, though, alfajores took on a totally different form in Latin America, where they are more or less two layers of cake with filling in between. 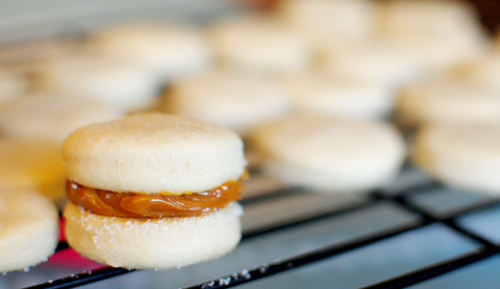 The most common Latin American variation, the Argentinian alfajor, consists of two biscuits joined together with jam or dulce de leche and covered in a dusting of powdered sugar. Sift flour and confectioner's sugar. Add to a food processor or electric mixer along with the butter, and pulse until dough resembles coarse meals, 20-30 seconds. While mixing on low speed, slowly pour in water and vanilla and mix until dough comes together. Divide dough in half, roll into two discs, cover in plastic wrap, and refrigerate for at least an hour. Roll out one of the chilled discs of dough to about 1/4 inch thickness. 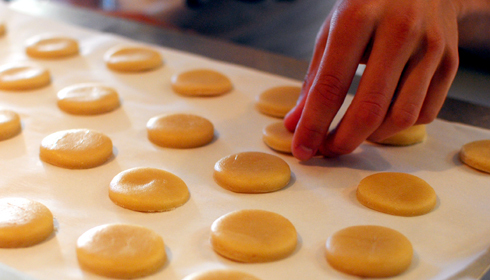 Using a cookie cutter of about 1.5-inches in diameter, cut out cookies and arrange on the baking sheet. Bake until lightly golden, 15 minutes. Transfer baked cookies to a wire rack to cool completely. To assemble cookies, spread a layer of dulce de leche on the flat side of a cooled cookie. Use another cookie to layer on top. Serve immediately. Note: do not frost the cookies until serving. If you need to store them, keep the unfrosted cookies in an airtight container and the dulce de leche in the refrigerator. Both stay good for up to 3 days. I'm not totally sure what alfajores have to do with Pan's Labyrinth, but then again, I'm not sure what Pan's Labyrinth has to do with modern Spanish literature. So they make a rudimentary pair, I'd say. And besides, it was about time Zach was introduced to the magic that is dulce de leche. And I've always wanted to make alfajores. And they are one of the most delicious cookies I have ever eaten. And that is not an exaggeration. I think it'll be a pretty successful presentation. Wow...these look delicious. I love dulce de leche. You should get an A+++ for this. Your spanish is great also. 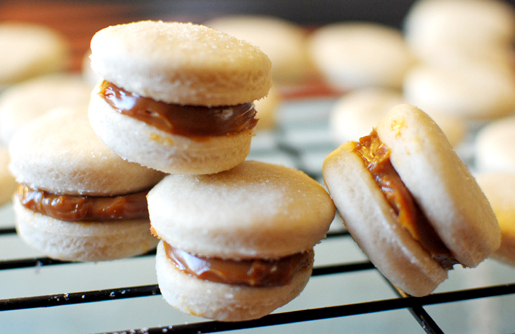 Beautiful photos -- these alfajores look absolutely delicious! We will have to make the recipe and compare with the ones we made last week using a recipe from Martha Stewart that was mentioned in an article we recently posted on our blog about what makes the alfajore such a special and uniquely Argentinian treat. Thank you so much for the kind words! And Argento Wine, please let me know how they turn out!